Anticipation and foreknowledge are essentials in planning and design. We want to make our designs futureproof if only that this helps us to avoid wastage from the need for subsequent restructuring. Futureproofing, however, has many more strands to it than just anticipating trends. It can promote those trends and it can indicate that we have considered our available options and, more importantly, the options that we wish to give ourselves, and get on with it accordingly. In a listing of Participatory Techniques, there are three methods that encourage participants to look into their futures: Enspirited Envisioning; Future Search; and Guided Visualisation. Each allows creation of either individual or shared visions for the future. What they lack, however, is any systematic way of looking at future options, nor do they address issues that some may shrink from or be uncertain of. It might be thought that no one can fully predict the future. Forecasts do turn out to be wrong sometimes and the impossible happens. So how do we cope in such an uncertain world? We could just react to whatever happens, or we could throw away our insecurity and embrace uncertainty. Stopping us from doing that though is human nature. Futurists and Foresight Studies use stories - called scenarios - to develop a long-term view of what the world might be like at some date in that uncertain future. The purpose of scenarios is not to predict the future, but rather to gain insights into the full range of possible and alternative futures in order to make better decisions and choices in the present. Coping successfully with an uncertain future calls for insight, intuition and creativity. Scenarios are stories about what might happen in the years immediately ahead. They are tools that help us focus on different plausible futures and play what if in a non-threatening environment. Using scenarios gets US past the impossibility of knowing precisely how the future will play out because it can give rise to a good decision or strategy that could work well across several possible futures. To find that robust strategy, multiple scenarios are created, such that each scenario is markedly different from the others. These sets of scenarios are specially constructed stories about the future, each one modelling a distinct, plausible world in which we might someday have to live and work. But wait a minute - plausibility is subject to our own blind spots and we sometimes need to be challenged by our scenarios. Herman Kahn, one of the founding innovators of the practice, developed scenarios to see past the cultural blind spot that thermonuclear war must never happen. What if it did happen? asked Kahn. What sort of world might the survivors face? Setting specific trends for the main driving forces of today to predict the events of tomorrow sets conditions for the scenario writing. The drivers have the acronym STEEP, which covers Social Dynamics, Technological Issues, Environmental Issues, Economic Issues and Political Issues. Below is an example of one of the scenarios written by Jessica and Heather at school in Florida. They were given the following trends for the drivers: over-population (S) genetic engineering (T) and scarcity of water (E). Hi! I am an average 14 year old girl living in the present year 2100. From what my grandparents passed down to my Mom and Dad many things have changed from the past to the present. Since the year 2060 we have been facing a water scarcity and have started to rely on other sources for water .We are producing more cacti and using their water for drinking. Another source we are using is ocean water, which we are purifying. My grandparents never had to face a water shortage growing up, unlike my generation is. Our population is increasing so rapidly that we have started to build homes beneath the seas and oceans. We have a special tram to transfer us from our homes underwater to the land above. We are finding more and more ways to help prevent diseases such as diabetes. Another thing we have begun to do is that instead of shots we implant medicines under the skin. People always say that the future generations are going to have an easier life but I have discovered that isn't always true! An allied technique to scenarios is the Futures Wheel. This tool allows us to explore the consequences of a trend, or an event or emerging issue, or a decision. It works as a way of consolidating information developed during research on futures, such as the data gathered during an environmental scan on a particular issue. As you work around the wheel, you note first-, second- and third-order impacts of a particular trend or event. 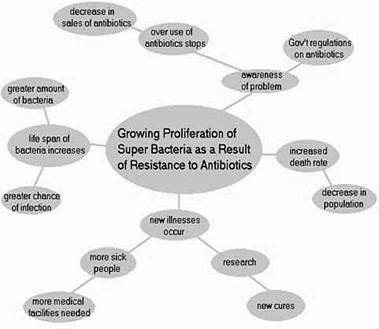 An example is given to the right of a futures wheel approach to antibiotic resistance from Jason, a teenager from Maine, USA. ISOLATE THE DECISION Don’t try to explore the entire future, ask yourself, What am I trying to decide? Narrowing the original decision question gives you much sharper insights. IDENTIFY THE KEY FORCES IN THE LOCAL ENVIRONMENT Forces such as development pressures, market constraints, social barriers or needs, or the existence of unfilled niches. ISOLATE THE DRIVING FORCES From the number of forces that could affect your decision, ask yourself what are the driving forces that are critical? Some driving forces effect everyone the same. Everyone, for instance, is driven by the need to cut costs, and the need to incorporate new technologies. But unless one of your partners is markedly better or worse at doing these things, they are not differences that make a difference. RANK THE DRIVING FORCES BY IMPORTANCE AND UNCERTAINTY Some forces are more important or far more certain than others. Local housing and population patterns usually change slowly. The most critical driving forces will be those that are both very important and highly uncertain. SELECT THE SCENARIO VARIABLES Work around the issues, re-shaping and re-framing them, drawing out their hidden factors, until you begin to come to a consensus about which are the two or three most important underlying variables that will make a difference in your decision. One way to generate scenarios from such variables is to cross them in a matrix - two major variables in a matrix gives four possible scenarios. FLESH OUT THE SCENARIOS See how the driving forces affect your scenarios. Weave all the trends and driving forces into the basic variables that you have selected, and see how they affect the stories you write. PLAY OUT THE IMPLICATIONS Examine your original question against the scenarios. If it only looks good in some and seems to leads to disaster in others, then it would be a gamble. Remember, you built the scenarios out of factors that were highly important, highly uncertain, and beyond your control. SEARCH FOR MARKERS Finally, look for the leading indicators that would tell you which of the scenarios - or which combination of scenarios - is actually taking place. How would you know? SPINNING SCENARIOS Spinning (creating) scenarios is a sophisticated, useful, and practical way to think about the future. Yet it is simple enough that you can do it yourself. Peter Schwartz describes a process for spinning and using scenarios in his book The Art of the Long View (Currency Doubleday 1996). When you spin scenarios, you end up with an array of plausible futures - usually four or more possible stories of how the future will unfold for you, your community, organisation, or whatever you are focusing on. The idea is not to decide which of these tales is right, but to create an array of mostly plausible futures, and then examine how prepared you are (and how prepared you could be) for each of them, and look for markers that will tell you which of them - or some other future you had not imagined - is unfolding. The point of scenario-spinning is to help us suspend our disbelief in all possible futures, so that we can see the possibilities with clear eyes. It works best within groupings of people, especially with people who don't share your assumptions. Schwartz identifies eight steps in the process, shown in the box. According to Schwartz, "You can tell that you have good scenarios when they are both plausible and surprising; when they have the power to break old stereotypes; and when the makers assume ownership and put them to work. Scenario-making is intensely participatory, or it fails." EUROPEAN AWARENESS SCENARIO WORKSHOPS is a European Commission project for increasing conscious participation in the choices associated with the impact of science and technology on society. Its purpose is to reinforce the links between research and development and the needs expressed by the social groups actively involved at various levels in socio-economic development. The project identified future scenarios as a method that would allow assessment of the social impact of introducing new forms of technology, and which would mitigate the frustrations associated with the Innovation Paradox. According to this paradox, society’s interest in the development of a new form of technology, and its possible applications, increases just when the possibility of influencing its development becomes restricted (i.e. biotechnology). By setting in motion a process for the creation of real awareness, the level of social frustration associated with the Paradox can be reduced. Thus the stronger involvement early on in technology innovation, the greater the social influence on its development. The chances of success in introducing a new technology will increase because society will have taken some responsibility in its development. Individual solutions using high technological input. Individual solutions using low technological input (therefore labour-intensive). Collective solutions with high technological input. The scenarios at the core of the awareness workshops are around sustainable urban living in the coming decades. The book Urban Ecology of the Future, by the Danish researcher Morten Elle, illustrates four possible scenarios of urban futures each describing a day in the life of an imaginary family that has to contend with the management of environmental problems, using various means and solutions, both technological and organisational (see box). In the course of the two-day workshop these scenarios help to stimulate imagination and discussion. The participants come from different social groupings: residents, technological experts, policy makers, and the private sector. During the first day participants are asked to imagine, in one positive and one negative scenario, how their city might be in the year 2010, and then reconstruct in reverse (backcasting) the history of events going back to the present day. The process of backcasting helps participants to understand the future consequences of present decisions and increases their awareness of the problems connected with sustainability. On the second day, the groups are given the task of formulating ideas for solving urban ecological problems in a sustainable way, with a focus on water supply and use, waste water, solid waste management and recycling, energy supply and use, and daily living and housing. Participants using the four scenarios as reference points and are called to reflect upon (and possibly answer)such tjhings as: How and to what extent should technology and/or changes in behaviour be the main drivers of sustainable living? Who is responsible for the solution of individual problems - the local authority, the individual household or some variation in between? Should solid biological waste be composted in a centralised public installation, a community scheme or in the garden of the house? Is incineration technology advanced enough to make it an option in waste disposal? Should energy technologies be home-based or centralised? build bridges between business, science and government, bringing together the knowledge and expertise of many people across all areas and activities; in order to increase national wealth and quality of life. EDUCATION, TRAINING AND SKILLS Giving people every chance through education, training and work to realise their full potential and thus build an inclusive and fair society and a competitive economy. SUSTAINABLE DEVELOPMENT depends on the effective integration of economic growth, environmental protection, and social progress - people, profit and planet. Sustainable development and profitability are twin goals.